"I don't think that we Brazilians are taking away Filipinos' jobs. That's not true coz everyone has opportunity. There's a lot of foreigners also here and we also do all the casting and the clients choose us. 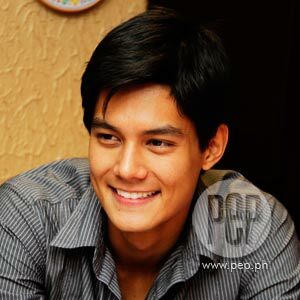 So we always do our best to do our work and if that doesn't happen, we just go to another country," says Daniel Matsunaga. Dahil ang pelikulang D' Survivors ng Astral Productions ay tungkol sa mga karakter na stranded sa isang isla after a plane crash, tinanong namin ang isa sa mga bida sa pelikulang ito na si Daniel Matsunaga: If ever he's stranded for real sa isang isla, sinong female celebrity ang gusto niyang makasama? "Oh, I would choose Giselle Bundchen! And I would be very happy and I would do everything so we would just stay in the island forever," sagot ni Daniel sa PEP (Philippine Entertainment Portal). Si Giselle na isa ring Brazilian ay tanyag na supermodel ng Victoria's Secret at karelasyon ng hunky football star na si Tom Brady. Sa tanong naman kung ano ang gagawin niya para kay Giselle, ipagluluto raw ni Daniel si Giselle at igagawa niya ng bonfire para huwag itong ginawin tuwing gabi. Sa local celebrities naman, ang choice ni Daniel ay ang bago niyang crush, ang Binibining Pilipinas-Universe 2009 na si Pamela Bianca Manalo. "We worked together, she's very, nice! We worked in the PHCare commercial and also we danced during the Binibining Pilipinas pageant. Hindi pa raw siya nanliligaw kay Bianca. "No, not really! I met her only twice, so we don't have time to be really close," sabi ni Daniel. Ni wala raw siyang cell phone number nito. "No, I don't have her number. You give me her number!" natatawa pa nitong sinabi. LIVING IN THE PHILIPPINES. May isa pang rebelasyon na sinabi si Daniel sa PEP, at ito ay ang kagustuhan niyang sa Pilipinas tumira habang buhay. "I will stay here forever! I hope I can get a Filipino citizenship. I want to bring my family here, yes, I want to bring my family here. I love the country, I love the culture, I love the people here, everybody is so kind. "I love the opportunities I'm having, and I love to doing acting as well so everything here for me is really very nice. The weather here is like Brazil so I would choose Brazil or Philippines to stay all my life. And we are very similar with food, people, weather, you know. So it would be an option for me to stay here for good." Pero hindi naman daw niya tatalikuran ang kanyang bansa. "No, I won't forget about Brazil because Brazil is really amazing," sabi ni Daniel. "The life I have there, with my family, all my family is there so everything I have in Brazil I won't forget for sure. But Philippines is something else that I'm gonna bring to my life, for my future. So it's an option between Brazil and Philippines. Only these two countries coz here I'm having opportunity for work and that I could also bring my family here, right? So it's an option for me and I would like to have it." So, naiisip din niya na mag-asawa ng isang Pilipina? "It can happen, why not? We never know the future." "Akihiro is a very good friend of mine. For me there is no competition between us. I met him six years ago, doing modeling also and I know that he is very popular here, and I'm very happy to being compared to him. But with Akihiro and me, there's no competition. We are good friends and we go out, to clubs. And me and Akihiro, we are very good friends so there's no competition between us," paglilinaw ni Daniel. TAKING AWAY JOBS FROM FILIPINO MODELS. Itinanggi rin ni Daniel ang isyung inaagawan nilang mga Brazilians ng trabaho ang mga Filipino models. "I think that's not true coz like every country, we have opportunities for everyone, right? Every country is open and I know that there are a lot of Brazilians here. But Brazilians love the country, love the Filipino culture as Filipinos love Brazilians, right? "And I mean, everywhere I have been... I have been modeling six years, and everywhere I have been, I had different experiences with these kinds of things. Because every country, there are different kinds of work with different people. And I mean, like even in Hong Kong, there are lots of Filipinos there also. "I live there for two years. Of course, there's a bit of competition between work. I think when you start something, like I start with nothing, I arrive in Philippines nobody knew me and I was just doing everything I could like working every day, doing my best to try to put my name higher. "I always do my job the best I could and even if there are free jobs, I was doing that, too. Like you start with nothing and then you keep growing slowly and I think that those people should not think about this because every country I have been, it's all the same and there are opportunities for everyone. "And all my life, I have been doing modeling, and I have nothing bad to talk about that because we just like to be here. And living with you guys because we love the country, we love the people, and, yeah, the opportunity came and we are doing our best to be like being a Filipino family. "So I don't think that we Brazilians are taking away Filipino's jobs. That's not true coz everyone has opportunity. There's a lot of foreigners also here and we also do all the casting and the clients choose us. So we always do our best to do our work and if that doesn't happen, we just go to another country. "That's what models do, the people who do modeling, they fly everywhere. I have been in 20 countries trying to find my market. I went Singapore, Thailand, Hong Kong, Taiwan, Malaysia, Indonesia, Cambodia, Germany, Holland, Spain, Italy, South Africa, USA, Brazil... So every country I have been, I was trying to find my market and luckily, Filipino people accept me as a normal person and simple person, that I'm just trying to put my name higher. "There's a lot of people from different cultures everywhere in the world. Also there are a lot of Filipinos in Brazil and they don't say anything also, so I think all countries are open for everyone and everybody has the same opportunity and it depends on the people, on what they want," mahabang paglilinaw ni Daniel. Bukod kina Daniel at Akihiro, nasa D' Survivors din ang isa pang Brazilian hunk na si Fabio Ide. Nasa cast din sina Lemuel Pelayo, Jubail Andres, Tetay Ocampo Marife Necesito, Darlene Anderson, Don Mendoza, Kerbie Zamora, Aaron Tuiza at si K Brosas. Ito ay sa direksyon ni Adolfo Alix Jr. at showing ngayong April 28 sa mga sinehan.